Strange things happen when we get hurt. Hurt is a sad feeling; therefore, it makes sense that we would respond in sadness when a spouse or mother-in-law (random examples, I assure you) hurts our feelings. However, instead of crying about our pain in such cases, we are far more likely to lash out in rage! Go figure. As it turns out, our reaction is explainable. Anger has two variants: primary anger and secondary anger. Primary anger occurs when a boundary has been crossed. Violation signals rage as a defense mechanism in order to mobilize an effective response. For instance, if we happen to witness Anger has two variantsa bully walk by our sweet little girl and pull hard on her hair, our instant rage will help us take quick action to address the situation. The same thing happens when our personal boundaries are violated in parenting: Picture a child not listening to his parent (a stretch of the imagination, I know . . .). Everything inside the parent says this scenario is w‑r‑o‑n‑g, and rage often rises to the surface (“YOU NEED TO LISTEN TO YOUR PARENTS, YOUNG MAN!”). In this situation, however, we need to turn the anger signals off and cool down a bit in order to come up with the most effective and appropriate parenting plan. Secondary anger—violent as it sometimes is—is, at its core, an emotional wound rather than a signal. 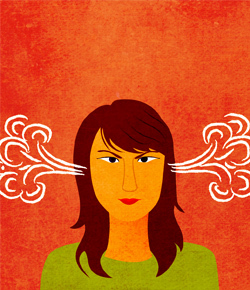 Sometimes called “reactive anger,” it is an emotional response rather than a pure emotion. The pure emotion is hurt. When a person feels hurt, he or she may respond with anger. It’s really no different than if the person responded by going immediately to bed. In the former case (when a person gets mad), the response is emotional in nature; in the latter case (when the person goes to bed), the response is behavioral in nature. In both cases, the true feeling being experienced is hurt. Let’s picture a husband saying something hurtful to his wife (again, you might need to think of something you read somewhere . . .). As soon as the words come out of his mouth, she feels a stab in her heart. It is visceral. It hurts. Now, I know you might be wondering why the husband would say such a thing, but keep in mind that marriage is complex, and few things are what they seem at first glance to be. In this case, for instance, this couple has been discussing the husband’s excruciating financial stress for several weeks in their marital counseling. He has expressed his fear of getting a heart attack from all the pressure he feels. With the counselor’s help, they have come to an agreement that the wife will, over the next few months, refrain from asking the husband to spend money on any “extras” for the family. Without It is visceral. It hurts.thinking, however, the wife now enthusiastically raises the idea of a family vacation, which will of necessity involve some expense. Hence the husband’s caustic reply. Her own behavior notwithstanding, the wife reels in pain. “How can he talk to me like that?” she wonders. She feels rejected, crushed, mistreated and very, very hurt. So she opens her mouth and starts shrieking at her husband. “HOW DARE YOU SPEAK TO ME LIKE THAT? DO YOU EVER THINK BEFORE OPENING YOUR MOUTH? YOU ARE MEAN, DISGUSTING, DESPICABLE . . .” That is secondary anger. Our sages tell us that anger is a dangerous feeling. Anger can cause tremendous spiritual harm, as well as emotional, mental and physical harm. It leads to many sins, including the transgressions of hurting people with words, treating people aggressively, using foul language, and many others. Secondary anger is the most dangerous kind of all because, sitting as it does on an open wound, one is likely to lash out with the full force of the emotional pain that unleashes it. Words once spoken cannot be retracted. Who knows how many broken marriages are the result of hearts broken by reactionary verbal abuse? In order to avoid the expression of reactionary anger, we must train ourselves to keep our mouths firmly shut whenever we feels pangs of hurt. G‑d offers a reward “brighter than the sun” to those who are able to master this skill. That reward will take place in the world to come, but there are also rewards that take place right here, in this world. With our mouths closed, our speaking apparatus cannot become an instrument of the evil inclination. We are saved from spiritual harm. Moreover, our most important relationships are saved from destruction. We are able to soothe ourselves, calm down and analyze the situation more quickly because we have not increased the chemistry of rage. We can begin to see the errors of our own ways, learning, growing and improving as a result. We are also able to think and figure out what steps need to be taken in order to rectify the situation. It’s all good! Sarah Chana Radcliffe is the author of The Fear Fix, Make Yourself at Home and Raise Your Kids Without Raising Your Voice. Sign up for her Daily Parenting Posts. Why Shouldn’t I Marry Someone Who Isn’t Jewish? Is it going to make you less communicative, if you are only good at communication. My girlfriend and me were on a very good track and I used to tell her to do things what she is doing now like giving time to her family friends and all. Now the real problem she has forgotten me in between all of that. Now she doesn't care if i call she will talk but very less and with no interest I tried being calm for last 10 days and it's hurting me inside that everything changed and now if I try to correct her or say anything she will just let me know that may be we don't have that kind of understanding, without even thinking once if she can put some efforts too. My understanding It seems to me that Mrs. Radcliffe is saying in the moment of anger to hold back from reacting. This way the person can think rationally about the best way to handle the hurt feelings. Of course eventually the issues need to be dealt with. We are just better off dealing with things when we are calm. We often will get much better results this way. Interesting, but... I find this article very interesting because I want to explode when someone hurts my feelings. However,the example you gave makes it the wife's fault. The way it is written, she should know better than ask that stupid question because they had already discussed it.